The principals of Silicon Valley have, in recent years, formalized their interview processes to reduce bias. Gone is the meandering ‘culture fit’ interview. Gone is the roulette wheel of questions, format, and interviewer skill. Gone is the unilateral and arbitrary gut decision of a hiring manager. In this new age of non-bias, interviews run on time, down to the minute. Technical interviewers choose from a given set of vetted topics. Non-technical interviewers select questions and have limited capacity to follow-up. Each interviewer provides input on a single evaluation vector. Even sharing a meal, that most human of activities, may be eliminated as too uncontrolled. I understand why this process was created. While there is still a large amount of randomness (“it took me 3 tries to get hired!”), it’s certainly less arbitrary. But has it really removed bias? Let’s talk about the legacy this “unbiased process” follows in. Both require some minimum level to be met to allow membership to a group. Both are designed to be free of bias against gender or skin color. Both are designed primarily by existing members of the group. Both are inevitably biased in administration, even assuming the best of intentions. Both Silicon Valley hiring processes and Jim Crow literacy tests have had inequitable adverse effects on underrepresented populations. To compare tech hiring processes with Jim Crow tactics is quite an assertion that requires some more explanation. In tech hiring, we often call our minimum level the hiring bar. That term implies our ability to distill a candidate down to a single score we can measure. History, though, tells us differently. Interview best practices shift every few years, with the previous guidance looking arbitrary and antiquated. For example, logic questions and whiteboard coding have both fallen out of fashion, replaced by live coding and whiteboard architecture. These exercises measure significantly different abilities! What we require a candidate to know is sensible but mostly arbitrary, just as whites during Jim Crow chose to require voters to pass a literacy test. The interview process is as formalized as possible and race or gender does not explicitly factor into the design. 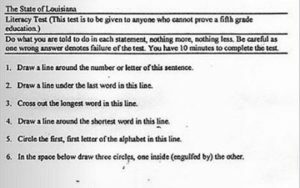 Likewise, everyone who received a literacy test received the same test. Designing an interview process means designing a way to identify candidates who will be high performers from those who will not. We do this by looking at our own “high performers.” There is a mountain of evidence that it’s nearly impossible to identify the precise reasons why someone is successful. The best we can do is to identify what sets them apart, with the assumption that this unique vector must be responsible for their success. The implications of this are the point of this entire post (designing an unbiased but exclusionary process). It is obvious why Southern whites chose literacy as a proxy for voting worthiness, though their choice was intentionally discriminatory and our choices are hopefully not. Similarity between candidate and interviewer continues to factor into performance and outcomes. Shared experience, context, and vocabulary plays a major role. This includes junior interviewers choosing textbook algorithmic exercises that evaluate irrelevant skills in senior candidates, and architects choosing a problem tailored to their knowledge and not that of who they are interviewing. This is inherent to our process, just as in the South, no number of court decisions created an equitable literacy test administration. Demographic representation in large Silicon Valley engineering teams generally maxes out at 20% women, and often far less. This is lower than representation in CS programs, which range from 20% (nationally) to 30% (Stanford) women. Representation of non-Asian/White people is in the same boat. This also excludes the huge number of people from non-CS backgrounds (self-taught, code school), which are more diverse than CS programs. There is indisputably an uneven adverse effect on woman and minorities. The fact that Silicon Valley engineers are not intentionally excluding people of color and women is irrelevant. It should be at least as irrelevant as the fact that literacy tests are not inherently discriminatory. In fact, their constitutionality was upheld repeatedly, as long as they were administered fairly, which was the push of many earlier court decisions. Literacy tests were finally and totally abolished not because they were inherently unfair, but because their effect was discriminatory. The Supreme Court of the United States eventually just got fed up with it. After years of diversity reports, we need to accept this: the result of Silicon Valley’s hiring process is to select for clones of the existing workforce. If we have inequitable results biased against women and minorities, does it matter if we believe we have an unbiased process? I don’t know the perfect hiring process. But I do know that what Silicon Valley has now is so far from ideal I would throw the whole thing out. We’re underperforming on basic diversity goals by 50% to 100% (i.e., we should have 150% to 200% more woman and minorities than we do now). We’re failing, but failure here is the one place Silicon Valley refuses to embrace and acknowledge failure. If we held diversity to the same import as we do product and revenue, this would be an all-hands-on-deck fire. We’d see tons of innovation in this space. But instead we are shrugging our shoulders and making excuses. Or shouting into a void. We need to do better.